This photo was created by Mohammad Reza Domiri Ganji, a northern Iranian photographer who uses HDR and fisheye lenses to creatively skew Muslim architecture into dazzlingly twisted shapes and colors. He also dabbles in landscape and documentary shots–candid-like images of locals writing or weaving carpets in a factory. 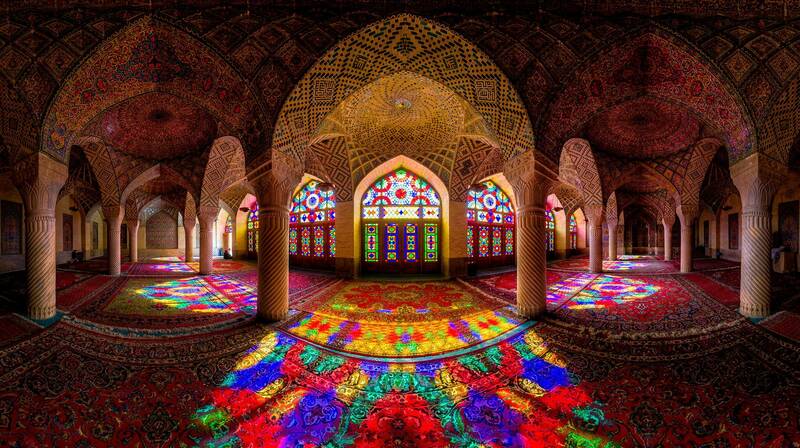 If you liked this photo, you should check out Mohammad’s interactive 360-degree panorama of the Pink Mosque. It’s great to see strong creative output from lesser-seen parts of the world, and this is a perfect blend of modern technology and traditional culture. Fabulous work…. I might have to go to this website every morning for some inspiration!!!!!! !